So, who is Dark Riku? Is he a new Riku Replica? Is he the old Riku Replica's heart? Is the Riku Ansem indeed? I've been discussing this with some of my friends and we are pretty much divided on this. I believe it is simply a "Repliku 2.0". He's like Riku, except he doesn't know how to change a lightbulb. He is Riku from when Ansem possessed him in the first game. No he's not? That's what the game leads you to believe into literally his death scene at which point Repliku reveals that it's not Riku-Ansem, but rather himself. Dark Riku: You're... not real. I'm the real one. Riku: Wait, aren't you me from a time when Ansem possessed me? Repliku: No. You beat Ansem and you're still here. This guy, is me. This, but don't they poke at the fact that their Riku is a replica even earlier than that? I recall them dropping a hint as early as the first Graveyard interval. I assumed this was a new Replica they had created rather than the Replica from CoM. They already had Riku's data. Why not just recreate another him? After you think about it, it's pretty clear that it's Repliku. - Despite supposedly being KH1 Ansem-Riku, he doesn't have the dual voice. - He refers to his time possessed in the past tense. - His personality is "douchebag" instead of "Ansem"
- Some of his battle quotes are just CoM Riku battle quotes. - And upon his defeat he says he's the real Riku, which he wouldn't do unless he was Repliku after he was modified into having Riku's memories. Yep! The hit is dropped by Remy's. "Oh, no. The replicas are way more real than you remember. I mean one stole my spot!" Well, if you remember in Chain of Memories, Replica Riku was initially designed with the awareness that he was a Replica. Then, Larxene convinced Vexen to re-configure Replica Riku's memories to believe that he was the real deal. This Dark Riku must have gone through the same process, The Seekers of Darkness made him assume that he was the real Riku, when in fact, he was just the Chain of Memories Replica with Xehanort's heart. I think they might be two separate Riku Replicas, both created from the same data. OH MY GOD! "Demyx" was autocorrected to "Remy's"! I'm disappointed in all of you for not noticing that. This. I'm pretty sure the second Riku Replica is meant to be a new one. A part of me is now expecting the two to merge since they're technically the same guy and eventually return. These games like to screw around too much with alternate versions brought forward in time and simultaneously all being able to exist stable on the same timeline. This is Riku Replica's heart, from the past and placed in Vexen's definitive replica? I like the cut of your jib Nomura. I caught the typo, but knew what you were going for, so I didn't really bring it up. I thought it was kinda funny, anyway. That's my story, and I'm stickin' to it! You're right again, the two Replicas are separate entities. I found the quote I was thinking of in my previous post! Marluxia: "Vexen's latest replicas are no mere puppets. The Riku Replica we used in Castle Oblivion was just a prototype. The next replica, the one crafted from Sora's memories, was real enough to join our ranks." I'm under the assumption, based on the final battles against the Real Organization, that the Riku Replica won't return in any way after this. The original replica basically forcefully removes his newer counterpart from it's body, leaving it so that he can fulfil his promise to NaminÃ©. 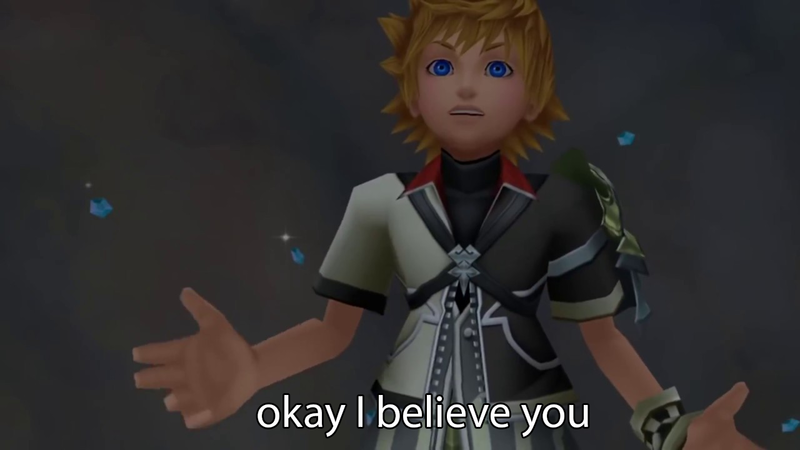 And when Riku questions him on why he didn't take the body, the Replica simply says that "the world already has you", and fades away. So if he wasn't gone before, he's most certainly gone now. I've always been kind of annoyed with how badly people wanted the CoM Replica to return, and didn't see the point as his story concluded well enough, but I'm quite happy with how he was re-implemented in KHIII. I forgot about his last line, so yeah it does sound like that's the last we'll see him. I didn't get why people wanted him back so badly either, but it was nice seeing him again.